Into your wide open belly, I dive. with fingers soft as waves. Inspiration: Without Mie scattering at sunset and sunrise, the sky along the horizon has only a dull-reddish appearance, while the rest of the sky remains mostly blue and sometimes green. 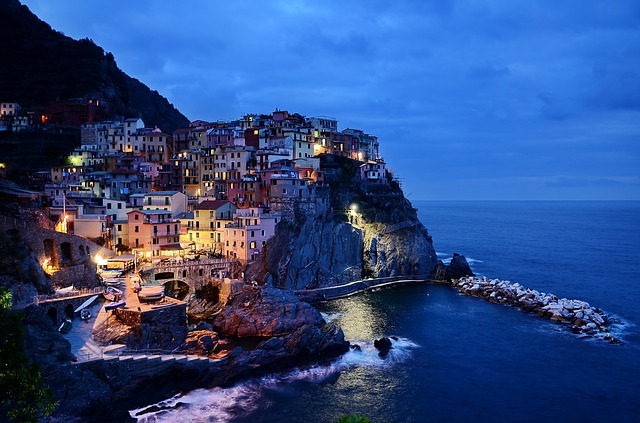 This picture of the romantic coastline of Cinqueterre in Italy by Babel photography captures the absence of Mie scattering just before sunset. Beautiful huh? This entry was posted in About Poetry, Shorts, Writing and tagged BLOGGING, Creative Writing, daily prompt, Freshly pressed, INSPIRATION, Mie, Mie Scattering, Mie theory, PHOTOGRAPHY, Poems, Poetry, Wikipedia, Writing, WRITING PROMPTS. Bookmark the permalink.